Break a plate! 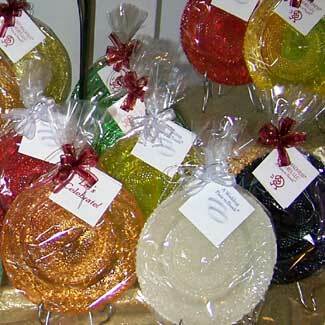 These pretty plates are made of candy, not glass! Many years ago, Judy Cerano had fantasies of throwing one of her nice china plates, because she was mad about an event in her life. That fantasy, many years later, turned into a business for her and her daughter, Jennifer Pricco. Judy and Jennifer created the Sweet Madness Plate to Break® in Judy’s kitchen in the fall of 2004. They started manufacturing the plates made out of candy in February 2006. 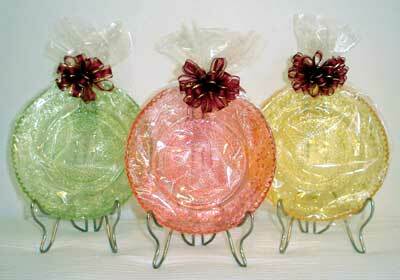 Then in 2007, they introduced the Wedding Plate to Break for wedding receptions and showers. And, the Let’s Cerebrate! plate was added to help celebrate holidays, birthday’s, graduations, showers, etc. Novelty Lollipops are also available in a variety of colors and flavors in Angel, Butterfly, Daisy, Heart, Shamrock, Dinosaur, Football or Baseball designs. 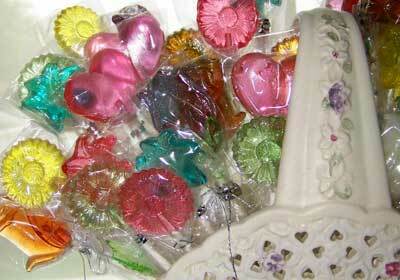 Each lollipop is individually wrapped in clear cellophane.